Stanley in A Streetcar Named Desire research papers are a character analysis on Stanley Kowalski in Tennessee Williams' play. 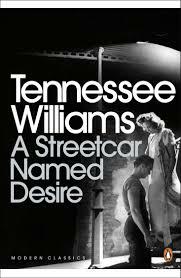 Research papers on Stanley in William's A Streetcar Named Desire give a character portrayal of one of literatures most beloved characters. The play is one of Tennessee William's best know and our writers can explicate any character from it you need explained in a written research project. Stanley Kowalski is presented as a man’s man in Tennessee Williams' play A Streetcar Named Desire. When he first appears, Stanley is accompanied by another male and carries his bowling jacket, symbolic of his strong masculine athleticism, which he demonstrates further by bellowing to his wife as he throws a bundle of symbolically sexual meat to her. Stanley is loud, imperious, and demanding. Stanley is symbolic portrayal of the masculine, primitive sexual desires in the play is neither subtle nor complicated, just as he possesses neither character trait. He “probes” Blanche symbolically at first, questioning her, trying to trip her up, then eventually tears away her thin cover of lies and exposes her with satisfaction to both Stella and Mitch as a liar and a whore who has been driven from her job for molesting a boy, and exiled from her hometown of Laurel (symbolically, a plant used to crown winners) for prostitution. Stanley’s drive to tear down pretense, expose lies and bare emotions is not only a symbolic means of desire fulfillment. He also hits his pregnant wife, slams dishes to the floor, and generally creates mayhem when he loses his temper. His physical assertiveness extends also to money, in contrast to Blanche’s ineptness with it, and he unabashedly promotes his right under an archaic Napoleonic Code to take part of any money due to Stella, his wife, from the sale of her family home. He proclaims himself King in his house, and like a Napoleon or King, satisfies his desires without reference to the damage he causes around him. Paper Masters writes custom research papers on Stanley in A Streetcar Named Desire and analyze the character Stanley Kowalski in Tennessee Williams' play.